September seems like an awfully long time ago, especially now that we have had our first real taste of winter with the arrival of some sharp frosts, snow and ice. they constantly amazed us with their insatiable curiosity and memory for detail. Over the weeks the children made pictures of dinosaurs using different media and techniques. We displayed them in Nursery on banners. In November many of the children went to firework displays and all of them were keen to create colourful pictures of exploding fireworks using lots of glue, glitter and sequins. We promise not to let any of the plastic end up in the sea. 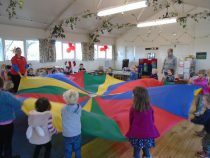 In December we held our Christmas party and played traditional party games including pass the parcel, musical chairs and statues. The children participated with enthusiasm and there was a certain amount of good natured competitiveness! As usual, parents provided a delicious feast of sandwiches, pizza, sausages, cakes etc and the children ate just about everything. 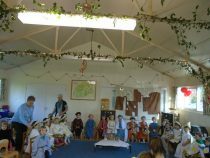 Over the weeks, we practised new songs for our Nativity which the children performed to parents and grandparents on the last day of term. The children sang beautifully and looked lovely in their various costumes. We look forward to welcoming everyone back to Nursery on Thursday 4th January and our new project for the term when we will be looking at technology in the environment and its benefits. Wishing you all a Joyful time this Christmas and Best Wishes for 2018.